Rails with Trails Rendering of Atlantic Ave and Pine Street in Audubon. Credit: Rails-to-Trails Conservancy. Camden County expects to name a designer for the multi-use path soon. It would add walking and biking access alongside the Conrail tracks that span Audubon to Haddon Heights. 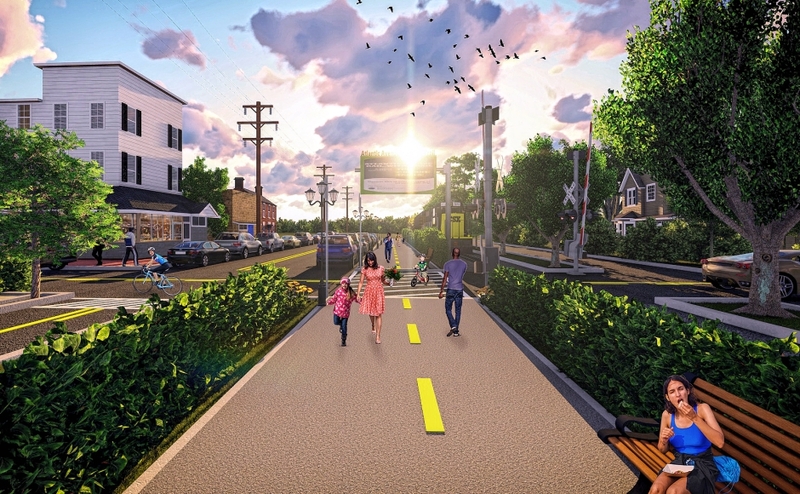 Rails with Trails Rendering of Atlantic Ave and Station Avenue in Audubon. Credit: Rails-to-Trails Conservancy. Planning is underway that would advance the creation of a multi-use trail from Audubon to Haddon Heights, a mile-long segment of the 32-mile Cross Camden County Circuit Trail, which offers an alternative to car travel from Camden City to Winslow. Jack Sworaski, Director of Open Space and Farmland Preservation for Camden County, said the county could hire a design consultant within a month or so. Four proposals are currently under review that would cover two-thirds of the cross-county trail, Sworaski said. 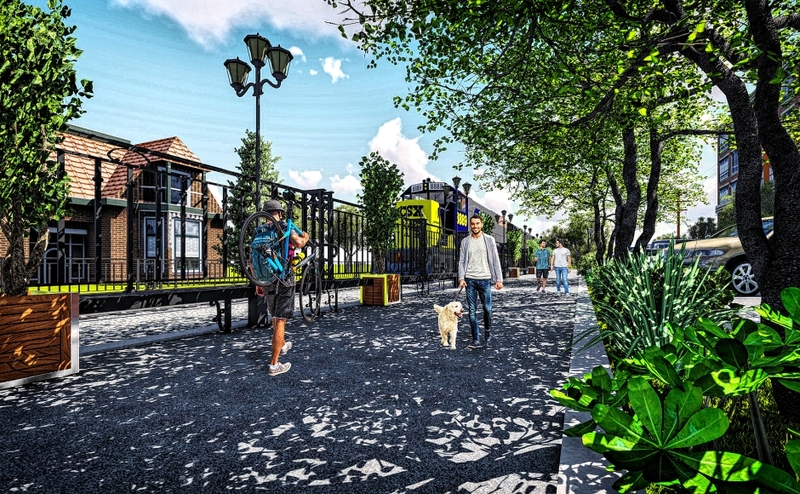 The county has also sought $1.5 million in funding for the construction of a trail along the Atlantic Avenue corridor, from Merchant Street in Audubon to Station Avenue in Haddon Heights. That money would come from some $77 million of federal Transportation Alternatives Program (TAP) and Transportation Enhancements (TE) grant, of which the New Jersey Department of Transportation has control until September 2020. If the funds aren’t allocated by then, they could be reabsorbed back into the federal budget. First phase of the Atlantic Avenue Rails with Trails project. Credit: Rails to Trails Conservancy. Sworaski said he’s “optimistic” that the project will find its funding, but the decision won’t be known for a while yet. One of the key elements that had previously back-burnered the project—cooperation with Conrail, which owns the land on either side of the tracks—has been promising in the case of the Atlantic Avenue path. He hopes the Atlantic Avenue corridor can find its design and construction funding, because it can serve as a viable test case for the remainder of the project. A key piece of that argument is the economic benefit of the project. According to analysis from the county, the fully built-out trail could generate as much as $19 million annually. Connecting Audubon to Haddon Heights could rejuvenate the small commercial districts of both communities, Sworaski said. Elizabeth Sewell – Rails-to-Trails Conservancy. Credit: Elizabeth Sewell. “One of the reasons for using the rail corridor is all those downtowns that grew up around that rail line 100-plus years ago,” he said. “People need a place to eat, they want to get something to drink, they want to ride a bike. Camden County has been working to create a “rails with trails” network since 2003, when Somerdale Mayor Gary Passanante initiated a push for the project. In recent years, the chief advocacy group driving the plan forward is the Rails-to-Trails Conservancy, a nonprofit dedicated to creating a national network of multi-use trails along the country’s railways. 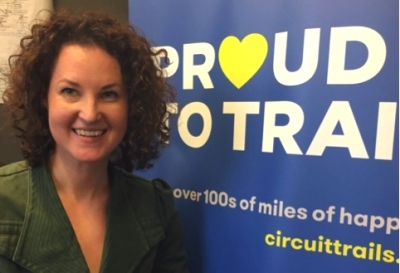 Liz Sewell, the conservancy’s Trail Development Manager for the Northeast Region, said the biggest challenge she faces is getting state and local governments to prioritize designing projects like the Atlantic Avenue corridor before the federal TAP and TE dollars sunset. Hard deadlines loom: September 30, 2019 and September 30, 2020. “I was amazed at NJDOT’s ability to fund or authorize $23 million in projects last year,” Sewell said. “They might be able to do a very similar thing. Atlantic Avenue Rails With Trails Full Map. Credit: Rails-to-Trails Conservancy. “One of the other options is to put these funds into a block grant, and that would save them from recission,” she said. The department seems to be on track to spend down its allocation this year, Sewell said; however, any projects awarded funds this year might still face at least a six-month design phase before money can be approved for their construction. “This land hasn’t even been surveyed yet,” Sewell said of the Atlantic Avenue project. Like Sworaski, Sewell believes the Atlantic Avenue segment is an excellent proof-of-concept for the line to Winslow. “Haddon Heights was developed around the railroad,” she said. It also wouldn’t hurt the chances of the project for supporters to raise their voices to elected and appointed officials, Sworaski said. Last year, the county and the conservancy organized a pop-up event showcasing the planned site of the proposed project.